Yesterday I got the two products I bought on ebay about two weeks ago. I bought a cleansing brush for my nose (#2) and peripera's I love BB light BB cream (#3) and I also got a lot of samples in the parcel too. 1. Missha's Near skin visible deep wrinkle filler. The deepest wrinkles I have are the expression lines in my forehead so, I will try this product in those and let you know how it performs. 2. Missha's Nose pore clear brush. I used it last night for the first time. The bristles are really fine and the brush is very thick and soft. It also makes a lot of foam. I will post a review on this tool once I've used it for a few times. 3. 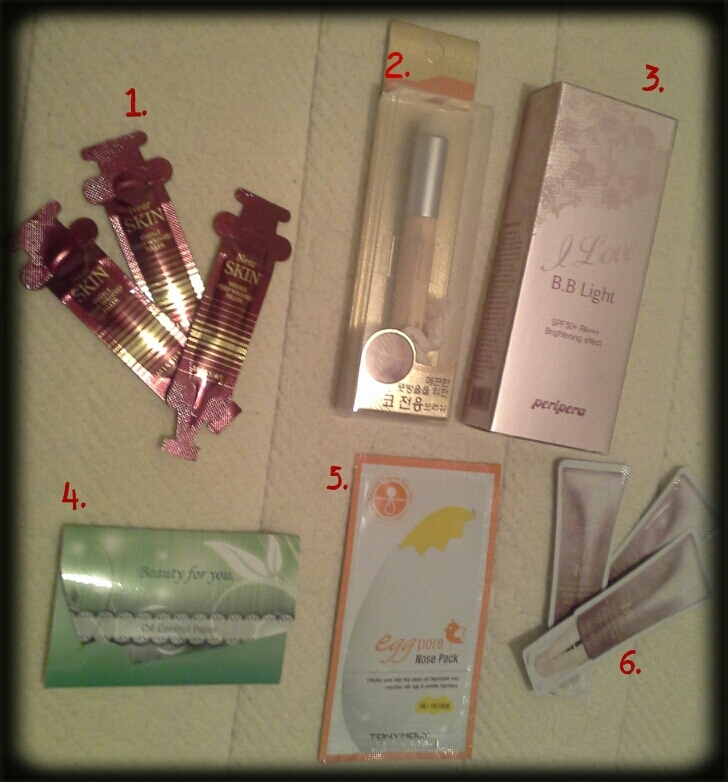 Peripera's I love BB light BB cream. I bought it cause it was on sale, but I don't intend to use it till I finish the Aqua petite jelly BB cream I'm using and loving nowadays. I don't know for how long I will resist the temptation to try peripera's BB cream though, because I wanted to try it so bad! 4. Oil control paper by Beauty for you. Brown blotting papers that don't seem to have any powder on them. There are 10 sheets. I don't think I'll be using them till the weather gets hotter. I'm not very fond of pore strips so, I'm not sure that I'll be using this. I find that masks work better for me. 6. Missha's Signature real complete B.B cream. The only Missha's BB cream I have ever used was the Perfect Cover and, though I did not dislike it, I didn't love it either and I couldn't use it everyday because it made me break out. But, since I have the samples, I will try the Signature real complete and let you guys know what I think about it.